As a psychology student at Elmhurst, you’ll learn more than the latest theories and research—you’ll learn to apply them, too. Students here have the opportunity to gain valuable hands-on experience through research projects and real-world field experiences. All students will have firsthand experience with research through our core curriculum, but students considering graduate school in psychology, or interested in research are encouraged to seek out of class opportunities. Students have the opportunity to get involved with research throughout their time at Elmhurst College. Typically students start by volunteering or earning research mentorship credit for working on a faculty member’s research project. Students gain firsthand experience with the research process—including conducting a literature review, running research subjects and coding data. Advanced students also have the opportunity to pursue their own independent research (either through the department or the Honors Program). Students work closely with a faculty mentor to develop a research idea, design a study, collect and analyze their data, and present their work either on campus or a psychology conference. Elmhurst students frequently see psychology professionals in action. Just as important, they get to know the psychological needs and issues in the community, and they learn real job skills. How? By working in the field as part of their course of study—in experiences like observing in a nursing home or helping teach social skills to elementary-school boys. The opportunities are many—and the rewards are significant. Psychology undergraduates can also obtain field experience through Elmhurst’s Weigand Center for Professional Excellence. 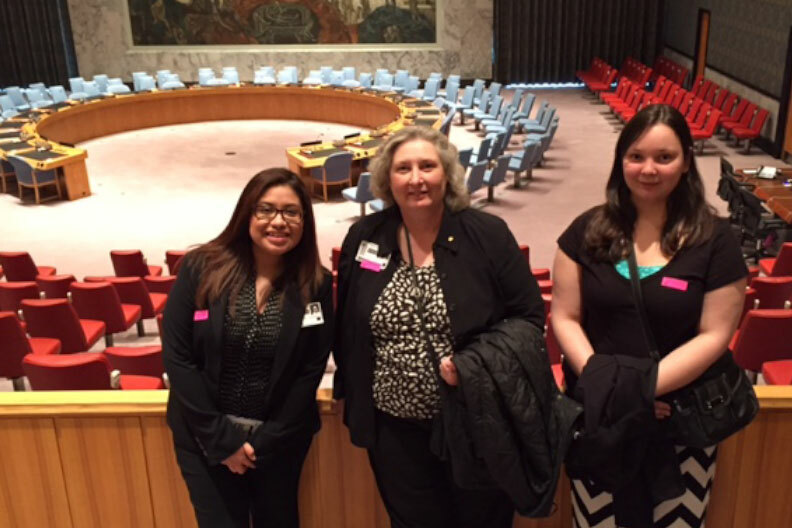 Dr. Sexton-Radek with two students at Psychology Day at the U.N. Psychology Day at the United Nations (U.N.) is a great opportunity for both undergraduate and graduate students to experience firsthand the impact of psychological and social sciences in the world today. Students travel to New York City to take part in Psychology Day and listen to the discussions of thought leaders in the field. This day celebrates the field of psychology and also aims to inform the community of the contributions of psychological science to the U.N.’s global human rights agenda. It provides an opportunity for psychologists and U.N. representatives alike to share missions, agencies and nongovernmental organizations and to discuss the role of psychology in addressing pressing global concerns. Psychology Day also introduces psychologists and their students to the advocacy of their peers at the U.N. and around the world.